Large handpainted beatle from Günthermann,Germany. Large hand painted wind up beatle from Günthermann,Germany .Made about 1900.Very good condition. ( minor repair to one leg) Working fine.Nice colours.L= 6 inch/ 15 cm. This is a lovely find: A tiny antique Hat Box for the dollhouse in a size that would be perfect for a little dollhouse lady. 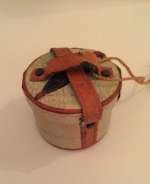 The box is made of cardboard, decorated in green with marks from travelling at all sides. And a lovely thing: An umbrella in tin is attached to the top. The handles are leather. The condition is lovely -near mint. And this tiny bit of luxury measures only H. 1-1/4" W. bottom:1 1/2" Lid. 2 1/2". (/H. 3 cm W.bottom. 3cm/ W lid 5 cm. This would be a lovely accessory for a dollhouse lady and in a perfect size. Also fine for a hat shop.A French Mignorette. All original.. Ca 1880.. 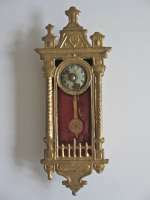 Die Wanduhr ist goldbemalt, Zifferblatt aus Metall, bewegliche Zeiger und Pendel. Schöne Form. Höhe 12,5 cm. B. 4,5 cm. Sehr guter Zustand. Um 1890. Für die Gutbürgerliche Puppenstube. Antikes Puppenstuben-Grammofon mit großem Lautsprecher. Das Grammofon ist aus Zinnguss hergestellt und von Hand bemalt. An der Seite ist ein Drehrad montiert. An allen Seiten schön dekoriert mit goldenen Girlanden. Größe: Höhe 4,4 cm. Die Basis ist 2,5 cm x 2,5 cm. Sehr guter Zustand. Deutschland um 1900. 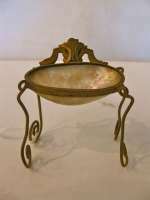 This stand with the mother of pearl "basket" was found in an early dollhouse with sewing utensils.It lovely shaped brass/ ormolu holder has a large mother of pearl "basket". 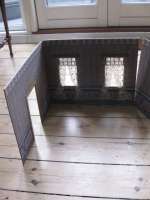 It would be lovely for sewing utensils in an antique dollhouse or room box.. H. 7 cm./ 3". Excellent condition. Faltpuppenstube 3 Wände mit Schnurr an den Zeiten zusammengehalten. Jeder Wand hat folgende Masse H. 31 cm B. 38 cm Gardinen, Tapeten alles alt. Muss wieder an den Seiten gebunden werden. Faltpuppenstube, 3 Wände, schwach Lilla getönt. Faltpuppenstube, 3 Wände, schwach Lilla getönt. . Zwei Wände mit Tür, Ein Wand mit zwei Fenster. Jeder Wand ist 31 hoch und 38 breit Originale Gardinen. 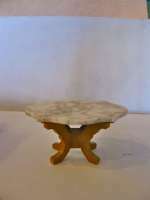 Antique Schneegas Table with marble top- The marble top is turtle shaped in a unique style. The marble is in a vary nice condition .The incredible pedestal base has a bulbous center mounted on a platform with four carved supports. Below the platform are four sprawling legs. A magnificent piece- Circa 1880. All original. The table is 2 1/2"h. The length of the table is 4 3/4"long x 3 1/8"w. H.6,5 cm.Length of plate 12 cm.x W.8 cm H.6 cmcm..Empire , Boulle style, Waltershausen, Germany.